This is how I dress most days, except in the summer when I’m suddenly seized by the urge to wear dresses to stay cool. So it figures that I’m thinking about ways to re-embrace this look right about now. What follows are the pieces I return to again and again, and a couple I want to take for a spin. A white button-down shirt is a solid starting point. 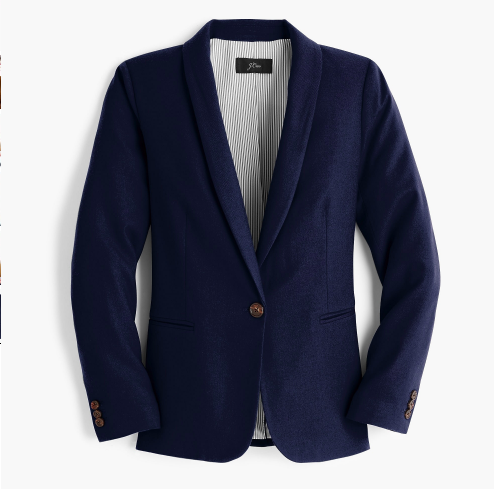 A navy blazer is just that much more sportif than black, and skews a little French. 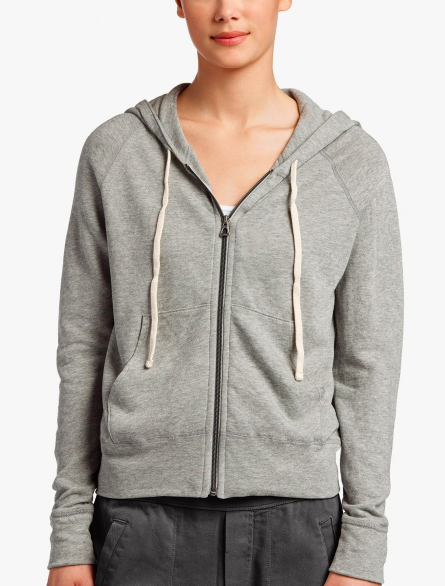 A classic hoodie comes in handy for layering; here’s another one I like that’s cheaper. 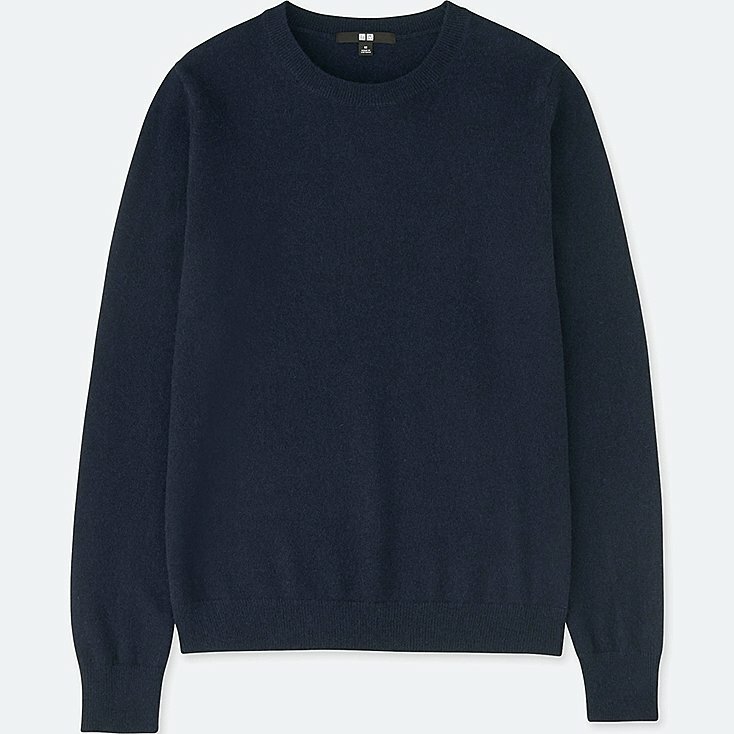 A navy cashmere crewneck keeps things clean-lined. 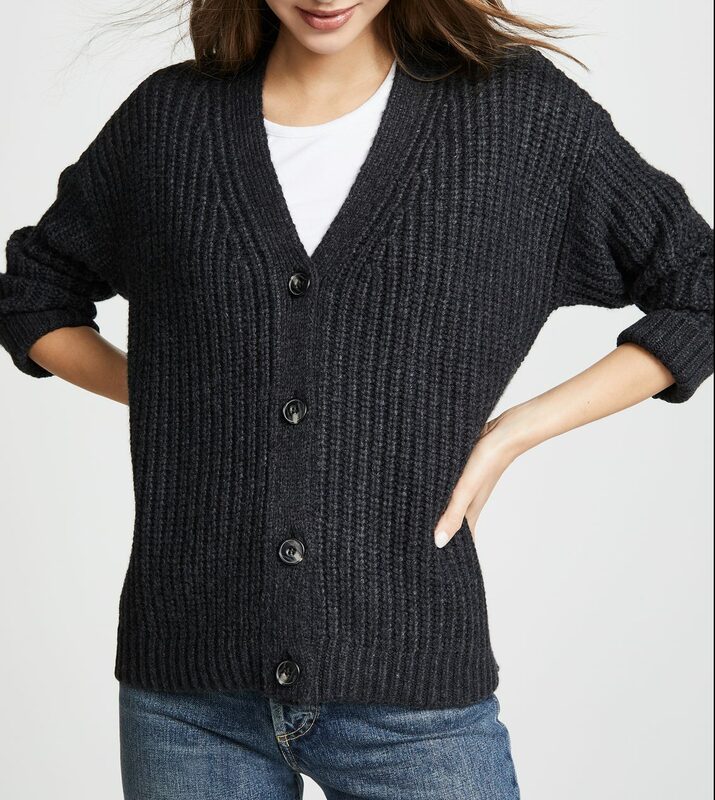 And a chunky cardigan looks great layered over a graphic tee. 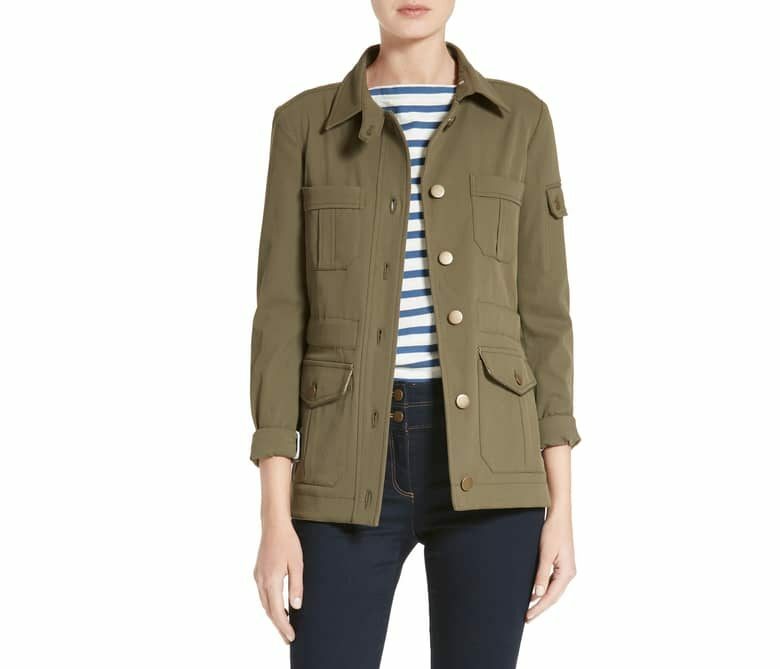 An army jacket is great with the aforementioned hoodie; here’s a cheaper option. Track pants are fun and the soul of comfort. I like the rainbow stripes on these, but here’s a classic pair from Adidas too. 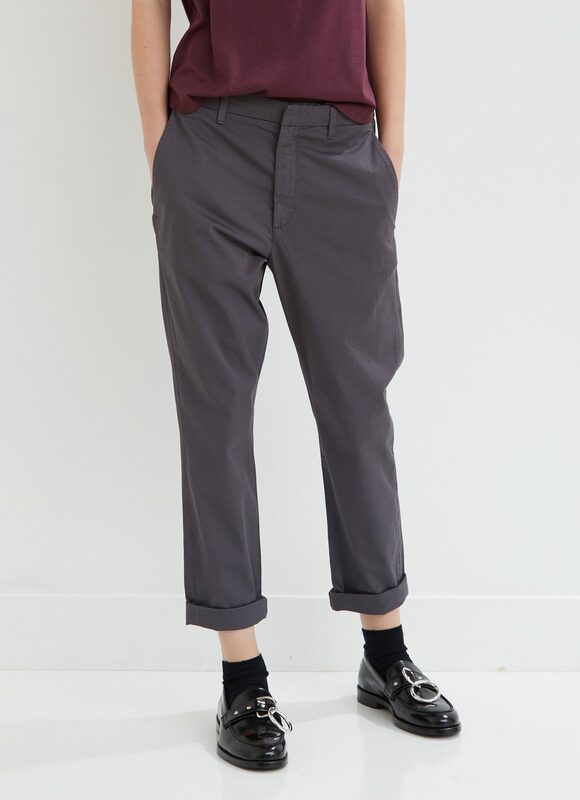 Loose-fitting chinos are elegant and easy. The woman pictured at the top of this post is wearing quite tight jeans, but I prefer a boyfriend style. A utility jumpsuit is one-step dressing at its best, and I like the low-slung belt on this one. You’ve got to have sneakers in your life if you’re interested in embracing this style, and they might as well be red. It is very Cool Girl to carry a utilitarian, no-designer canvas bag. I’ve recently become obsessed with Wildfang, which is a great source for tomboy basics—and not-so-basics. I've recently become obsessed with Wildfang, which is a great source for tomboy basics—and not-so-basics. I wear all these styles except jumpsuits and blazers. And how awesome are those loafers shown with the Hope chinos! Great selection. 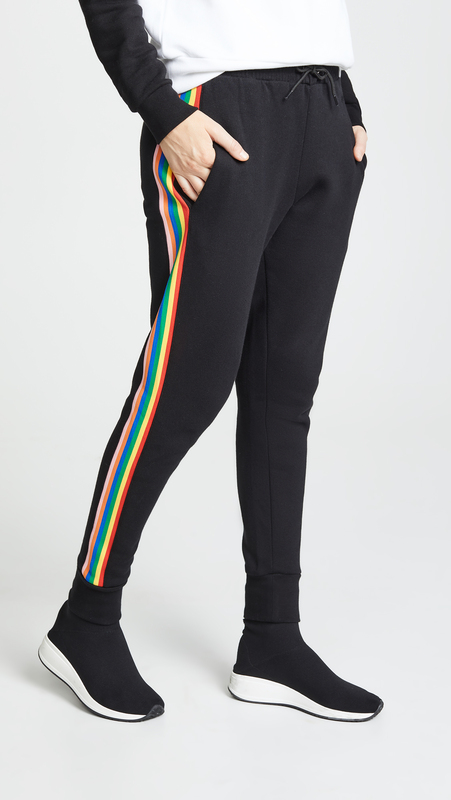 WANT those rainbow stripped track pants immediately!! Cute looks! You mention layering over tees–my tees last about one wash before they get little holes, especially where my jeans button rubs against them. Does anyone have tees they can recommend that don’t cost $70 each and do last? Cute looks! You mention layering over tees--my tees last about one wash before they get little holes, especially where my jeans button rubs against them. Does anyone have tees they can recommend that don't cost $70 each and do last? My Everlane tees have lasted for a few years and look good as new. I have purchased both women’s and men’s styles. Most are around $20 and come in a range of basic colors, classic, and trendy fits. Hope that helps! My Everlane tees have lasted for a few years and look good as new. I have purchased both women's and men's styles. Most are around $20 and come in a range of basic colors, classic, and trendy fits. Hope that helps! This is my style too so thank you for this! I absolutely lived in cashmere sweaters last year but I’ve got to say they have seen better days, considering the price. Cashmere pills like there’s no tomorrow! I’ll try the Uniqlo one. It’ll pill too but at least the price is reasonable. This is my style too so thank you for this! I absolutely lived in cashmere sweaters last year but I've got to say they have seen better days, considering the price. Cashmere pills like there's no tomorrow! I'll try the Uniqlo one. It'll pill too but at least the price is reasonable. I enjoy all of this — seeing it and wearing it — and am sending a shout out to all the lesbians who were wearing “tomboy style” back in the day when it got them called out and harassed. As we know well, fashion and style doesn’t happen in a cultural vacuum and those who resisted the stereotypical norms for women helped broaden the sartorial norm for all of us. I enjoy all of this -- seeing it and wearing it -- and am sending a shout out to all the lesbians who were wearing "tomboy style" back in the day when it got them called out and harassed. As we know well, fashion and style doesn't happen in a cultural vacuum and those who resisted the stereotypical norms for women helped broaden the sartorial norm for all of us. The Emersons fit very large! Have you tried Citizens of Humanity "Emerson?" They're a slim boyfriend. I also have a Paige "Brigitte." The Emersons fit very large! those rainbow stripe track pants tho. 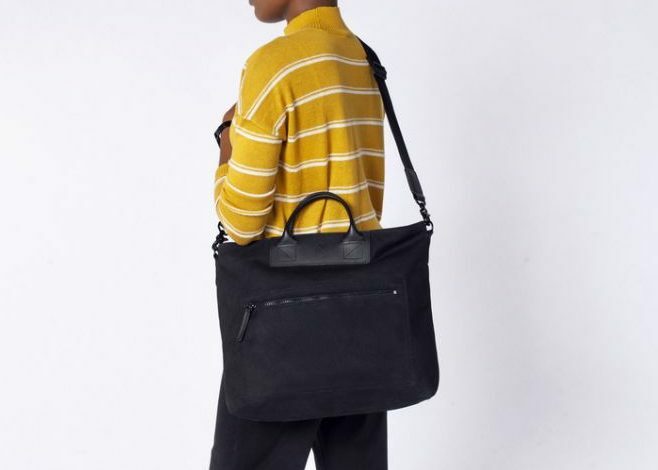 J’adore the lanky, sometimes slouchy, minimal look. Alas, I realized in my late 20s/early 30s that these cuts and lines often don’t flatter a short, curvier, bustier woman. So I’ll continue admiring other taller, lankier women in that look instead. J'adore the lanky, sometimes slouchy, minimal look. Alas, I realized in my late 20s/early 30s that these cuts and lines often don't flatter a short, curvier, bustier woman. So I'll continue admiring other taller, lankier women in that look instead. The thing I love about the overall look in the first pic is that it skates so close to the edgy tomboy rockstar look, which I love too. I can see Alison Mosshart or Francoise Hardy or Aimee Mann rocking this look (again, thin, lanky gals). Ditto. I’m not very short but this looks kooky on my curves. I’d love to fit a khaki pant without any side pockets. Love the look though. Ditto. I'm not very short but this looks kooky on my curves. I'd love to fit a khaki pant without any side pockets. Love the look though. I LOVE the suede tretorns. I have them in a red/orange that pops and the tiniest bit of a platform. They are super comfortable and have become my go-to sneaker. Bought them from Off 5th. what’s going on with the sneakers in the first photo – are they converse high top platforms – is that a thing now?? has anyone tried those cute suede tretorns? i bought a canvas pair a few years ago & was disappointed, nowhere near the padding they used to have. i want those rainbow trackpants and strongly believe more clothing should feature rainbow stripes. i love tomboy style-especially because it makes the best backdrop for JEWELRY ! what's going on with the sneakers in the first photo - are they converse high top platforms - is that a thing now?? has anyone tried those cute suede tretorns? i bought a canvas pair a few years ago & was disappointed, nowhere near the padding they used to have. i want those rainbow trackpants and strongly believe more clothing should feature rainbow stripes. i love tomboy style-especially because it makes the best backdrop for JEWELRY ! I do love a boyfriend jean for comfort but find I still need to wear something fitted on the bottom. As hard as I’ve tried, can’t seem to escape the skinny! I hate tight tops more than I hate tight bottoms. I do love a boyfriend jean for comfort but find I still need to wear something fitted on the bottom. As hard as I've tried, can't seem to escape the skinny! I hate tight tops more than I hate tight bottoms. I’m all about this! Good distraction from the very triggering and upsetting testimony of the brave Dr. Ford. God bless that woman. I'm all about this! Good distraction from the very triggering and upsetting testimony of the brave Dr. Ford. God bless that woman. She’s a goddamn American hero. She's a goddamn American hero.